Gene George practices in the areas of estate planning, probate and trust administration, and Continuing Care Retirement Communities. He received his undergraduate and law degrees, with honors, from the University of Florida. Mr. George has served as Director and President of the Sarasota County Bar Association, Chairman of the Twelfth Judicial Circuit Grievance Committee and Chairman of the Circuit Judicial Nominating Committee. He has served as President of the Southwest Florida Estate Planning Council and Chairman of Sarasota County Bar Association Estate Planning Section. He was appointed by the Governor to the Continuing Care Advisory Council and served three terms. 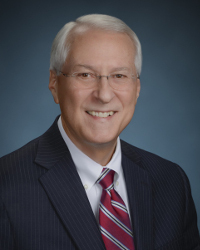 Mr. George has served as Chairman of the Board of Directors of the Sarasota Chamber of Commerce, President of Gulf Coast Kiwanis and as an Elder and Clerk of Session of Pine Shores Presbyterian Church. He is a graduate of “Leadership Florida,” a statewide program sponsored by the Florida Chamber of Commerce.